Are you fascinated about understanding our world at the subatomic scale? Join us to learn more about the nuclei inside atoms down to the most elementary building blocks of matter! 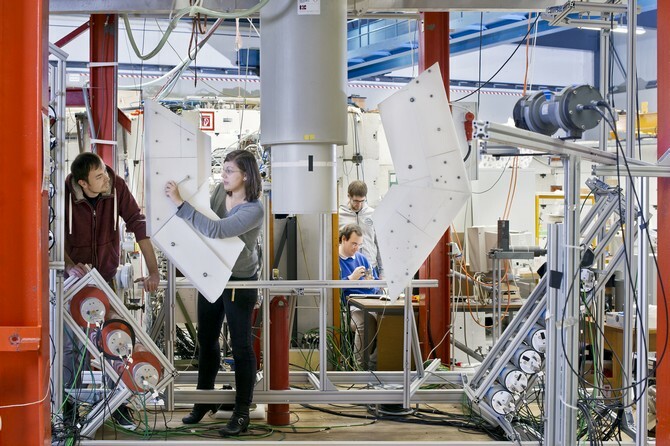 At the Tandem accelarator in Garching, Master students and doctoral candidates from Jean-Côme Lanfranchi's group characterize the detectors. Neutrons are shot at it and the reaction is measured. This facility ist unique in the world. Foto: TUM/Heddergott. The Master's degree programme in Physics (Nuclear, Particle and Astrophysics) is a two-year graduate program taught in German, designed to give students an insight into current research trends and new developments in nuclear, particle and astrophysics. A mentor can give you advice in choosing the specific courses. If you are interested in a given research area, it may be helpful to choose a mentor working in it (e.g. see the lecturers of the courses). The study program of the first year of studies can be organized individually. The following study programs show examples of how the first year of the Master's degree program Nuclear, Particle and Astrophysics could look like. Talented students can continue the Master's research phase seamlessly with a doctoral project, speeding up their academic career. Already during their research phase these students may join the Department Graduate Center Physics and participate in the program of TUM Graduate School. The "Direct Track" combines the advantages of the traditional model with the speed of a "Fast Track" – without the disadvantages like a (formally) missing Master’s degree. Direct Track to your Ph.D. Talented students can continue the Master’s research phase seamlessly with a doctoral project, speeding up their academic career. The exam and study regulations form the legal basis for your studies. In the study program description the program is described extensively for the QM system of TUM.